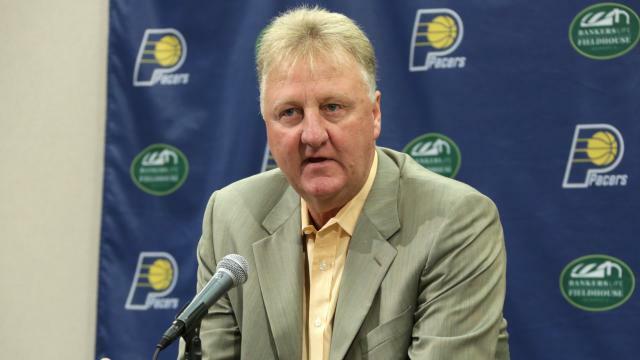 Larry Bird is stepping down as President of Basketball Operations for the Indiana Pacers, per the Vertical's Adrian Wojnarowski. According to Woj, Kevin Pritchard, the current General Manager of the Pacers, will take over Bird's role effective immediately. Bird will remain with the club in a consultant role, though Wojnarowki reports the Orlando Magic have been putting out feelers regarding his availability. The Pacers have declined to comment on the move, other than to announce Bird will hold a press conference this Wednesday to elaborate on his future with the team. It is impossible to say with certainty what precipitated this move without more information from the legendary former Celtic or the club, but the recent sweep at the hands of the Cleveland Cavaliers in the first round of the NBA Playoffs may have been a factor, as well as the open secret of star Pacer Paul George's dissatisfaction with his situation with the team in terms of fit and future. ESPN sources say Indy ownership felt compelled to hear out Paul George suitors but that Larry Bird was determined to swat away all pitches. Rumblings of tensions regarding the future of the club between Bird and ownership may also be related, as rumors of Bird's unwillingness to move George in a trade to Boston and several other inquiring clubs serving as a point of friction. Whatever the case, the landscape of the NBA management carousel and quite possibly also the summer trade market may have just gotten a lot more difficult to read, at least for now. If you wanted Paul George to stay, Larry Bird was probably the only guy who would have held on to him until the bitter end. Right or wrong. For more stories about the Pacers on CelticsLife, click here. For more by Justin, click here.